Our first camping trip this year was at Camp Kozarica in Pakostane, as our tent did not survive the rain at Camp Galeb last year in September, and as I didn’t find any place where we could buy a “real” tent for this season, we had decided to start our camping season in Mobile home (-: which we had booked for a weekend. 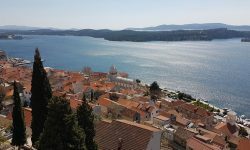 We left Split around 11 Am and took the Highway to Sibenik, from there on we followed the coastal road to Pakostane, which was a 1.5 hour drive. The campsite was well sign out on the main road, so we ended up by the reception with out any de-tours (-:. At the reception we checked in by the friendly receptionist, who also showed us where to find our mobile home. For the car we received a window sticker as well as a Card to access the gate, for the adults we received bracelets which was to access the toilet building and to exit / enter the camp towards the centre. 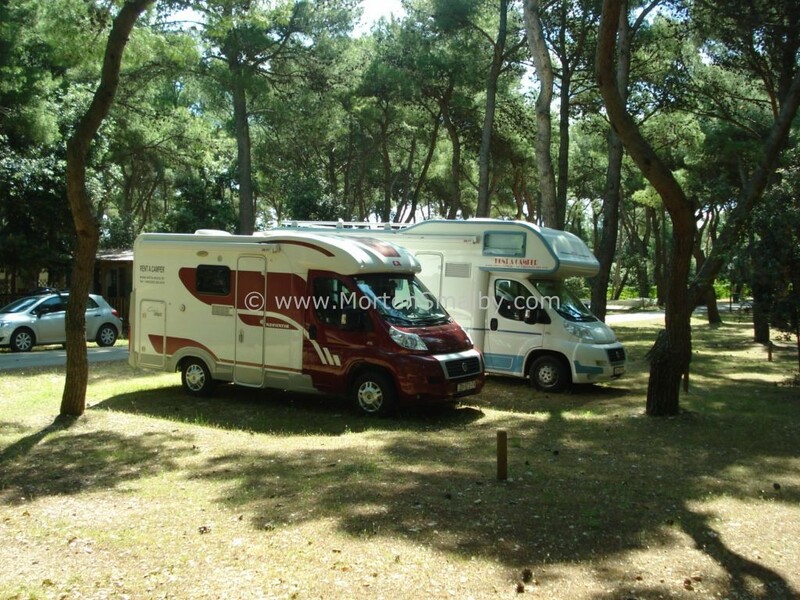 At about 1 AM we parked in front of Mobile home, our first impression was Wow, the Mobile was bigger and more luxurious then we had expected, kids where trilled, so our first camping weekend of the year started out in the best possible way! 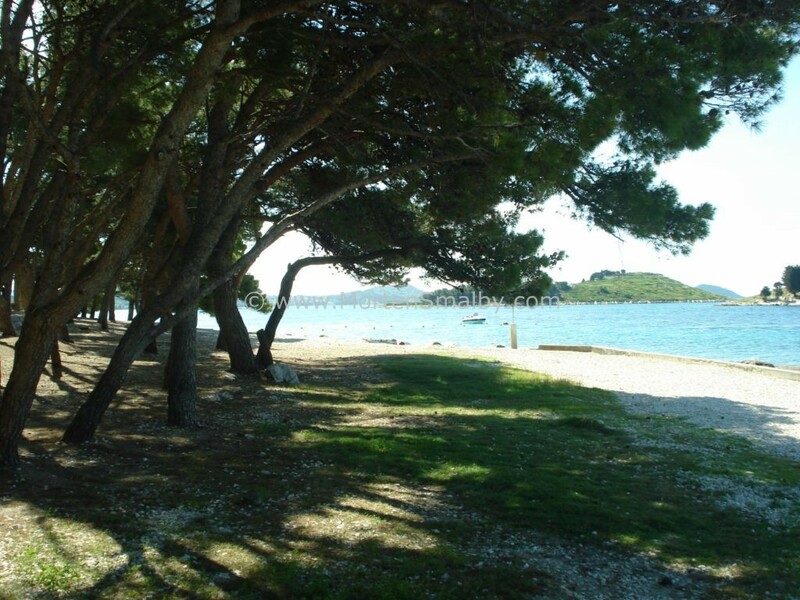 During the weekend, we went swimming, explored the campsite, explored Pakostane. Below we have made a summery of our experience and recommendation for a holiday in Pakostane. 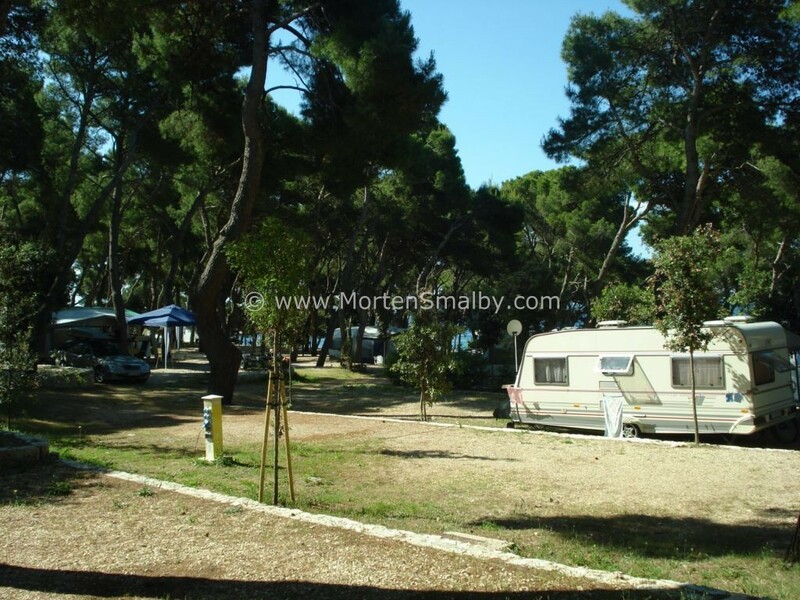 The Campsite Kozarica is situated a few hundred meters north of Pakostana, the campsite is basically shaped like a jumbo soccer pitch, stretching from the reception down to waterside. The camp offers 3 types of pitches, A, which is just next to the water, B, (which is behind A), and C which are towards the reception end, all pitches have electricity, which could be reach with less then 10 meter cable, the A pitches also have water and even water drain. 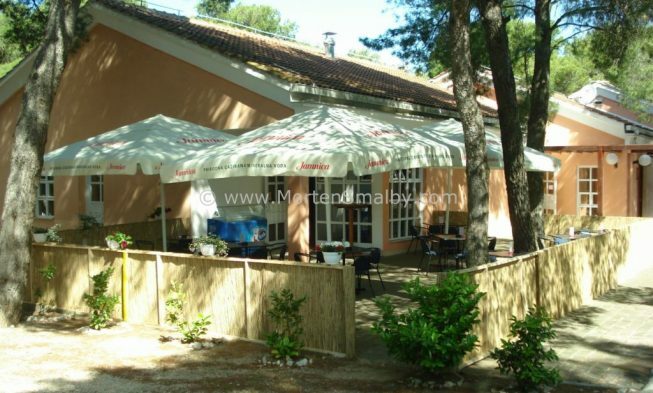 Next to the reception there is an un-parcelled camping area, with electricity. The majority of the mobile homes are situated on a small hill between the Piches B and C. Our mobile home was in third line of the mobile homes, but do to the hill we had some sea view from our terrace. 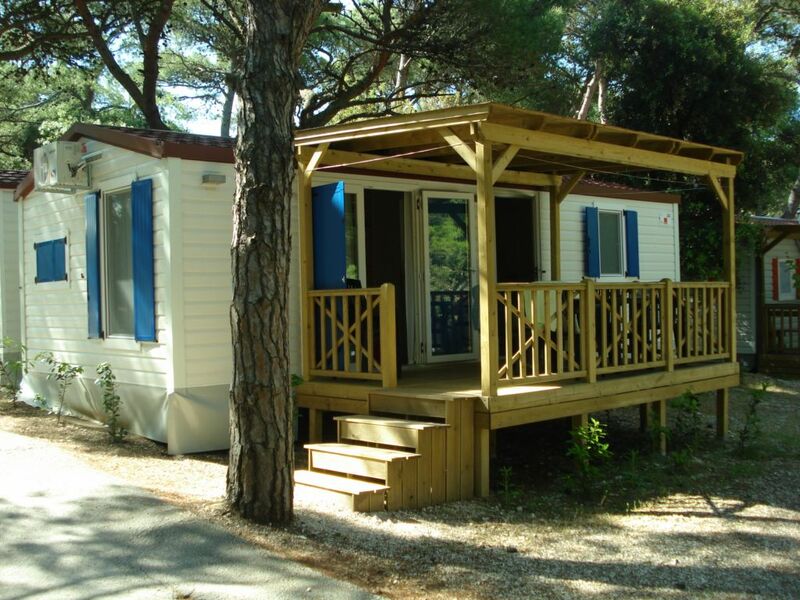 The mobile homes are available in different sizes, our luxury mobile home, had two sleeping rooms, (one with double and one with two single beds), a small toilet and a bathroom with shower, the living room / kitchen area was very big, the corner couch, could be used for two additional sleeping spaces. At the outside area there was a nice wooden balcony. The mobile home was fully equipment for 6 people, equipment includes, SAT-TV, air condition, a large fridge and a small freezer. 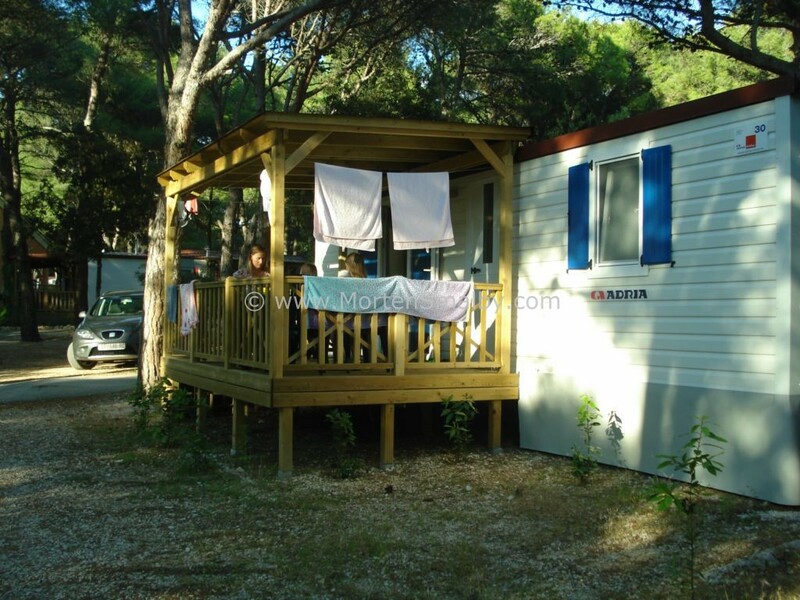 The camp has two sanitary building, both clean and in very good conditions, outside the sanitary building there is space for washing dishes, a laundrette and disposal area for chemical toilets are also available. For the sport enthusiast there is a volleyball and Pétanque pitch as well as the possibility to rent bikes at the reception. 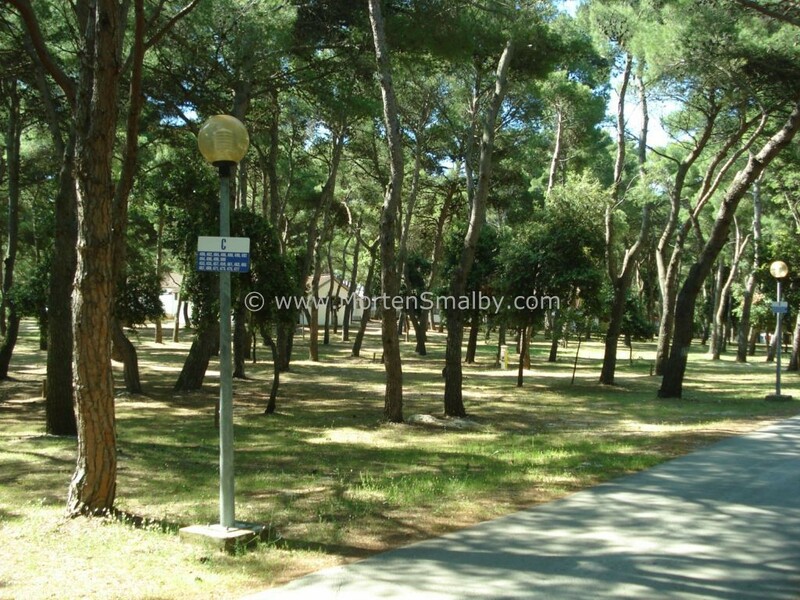 For the smaller ones there is a play ground, and a garden where they can explore the nature of Dalmatia. At the centre of the camp there is a Snack bar and a small supermarket, here freezing boxes are also available. Next to the sea there is a coffee bar. The beach is mainly concrete and rocks, but there is also a small area with pebble. The campsites is covered with large old trees (10-15 meter high), which provides plenty of shadow basically everywhere on the campsite. Wireless internet was available on almost whole camp area, price 30 kuna a day, which is very reasonable compared to what I have seen on other campsites (additionally there is an internet cafe by the reception). Camp is only 10 minutes foot walk from the city centre. Compared to Split area, the beaches was of course not a highlight, but less then 5 minutes walk from the camp there is a nice sand beach. A few more activities for kids would have been nice, but I guess in main season when is plenty of other kids to play with it will not be a problem. The city of Pakostane has about 3.500 inhibitors; the city is located at the northern end of the Limestone reef which separates Vransko Jezero from the Adriatic Sea. Take a walk along the water, from the city centre to Camp Kozarica (or the other way around), along the water you have several cafe bars and restaurant with great view on the water. 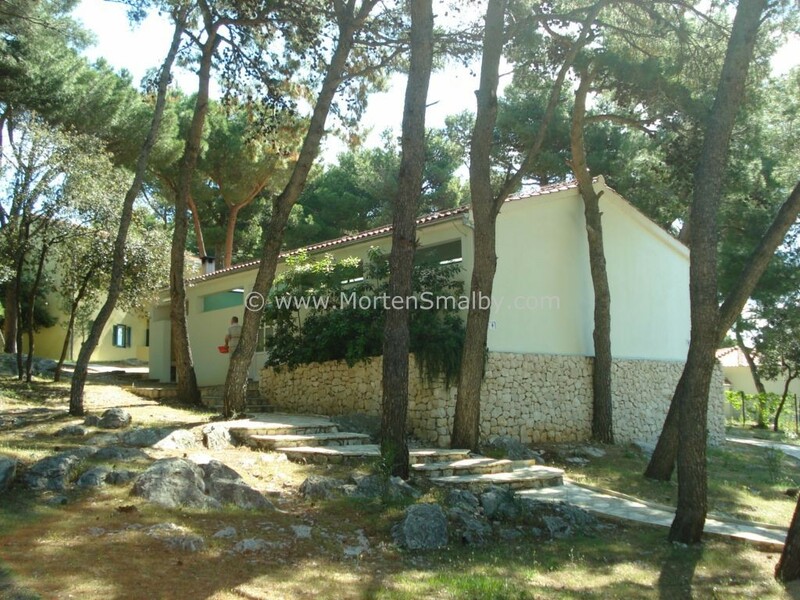 Visit the near by Vransko Jezero, which is one of 8 nature parks in Croatia, around the lake there are several viewing points / information stations, which can be reached by car. Bike riders can circle the lake on the 38 km long bike trail. The National Park Kornati is basically in front of Pakostane, several companies are organizing boat excursion to the national park. 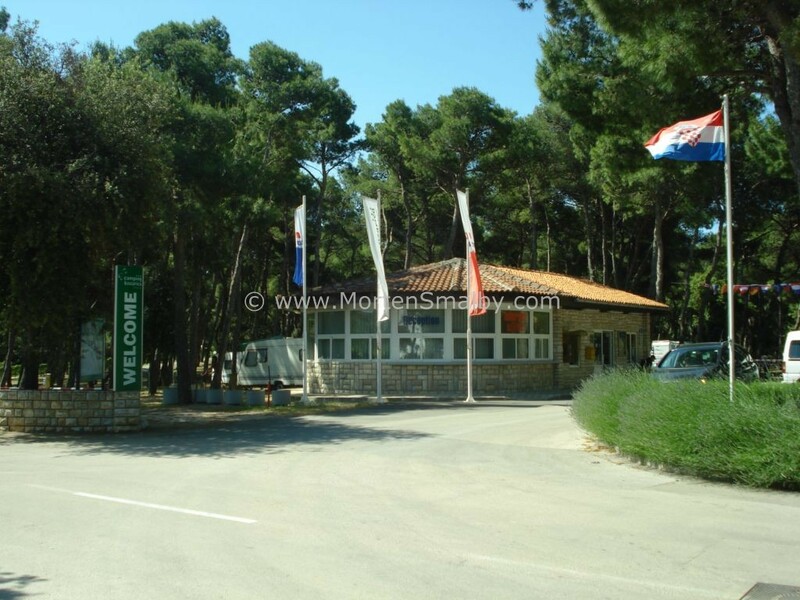 If you are driving to Pakostane, you can exit the Motorway A1 in Zadar (Airport exit) and follow the coastal road, other alternative is to take the next following exit. Well I must confess, we didn’t manage to try any restaurant in Pakostane, but the restaurant Sicilia which you see on the picture here, seamed very popular, I noticed that it was fully packed both evenings, so I guess the food must be good there? if not then it must be the view from the terrace which attracts the people! Also opposite to the Camp reception there was a very nice looking restaurant. As I mentioned earlier there is a nice sandy beach just few minutes walk from Camp Kozarica, on the other side of the town centre there is a long pebble beach, which was just getting a major clean up when we where there. First of all it was excellent to go camping again, the luxury mobile home is something one could easily get used to! But most importantly, the trip was very relaxing, we went swimming, walking, played games on the balcony, and I didn’t turn on my laptop and the kids didn’t watch any television, this is a sure proof that everybody was having a good time and enjoyed the relaxing weekend in Pakostane.